I love these monthly themes that we have in our Bread Bakers group. For the month of September Kylee of Kylee Cooks suggested we bake with pumpkin or pumpkin spices or both. I nearly skipped this round as I have already baked quick pumpkin breads and pumpkin muffins. Pumpkin pancakes didn’t sound that interesting. Then I came across this interesting yeast bread on Chef Bikeski’s website. Fell in love with the lovely sunshine coloured bread. Baked 2 small loaves of this bread. Gave one as a present to a family friend and the other one we enjoyed it toasted with some butter, cheese and soup. Semolina adds an extra crunch to the bread. Eating the bread without toasting makes it taste like a normal bread but toasting it makes it crunchy. I didn’t have any hazelnuts so I added walnuts instead. I love pumpkin but usually use it make soups or as a curry. Here in Kenya we tend to get pumpkin mostly whole year round. The locals make a lovely stew with pumpkin, amaranth leaves and if you’re at the coast, fresh coconut milk is added to it. We rarely see those huge pumpkins that are available in US or Canada. We get smaller ones and sometimes they will appear green with streaks of orange or yellow. So here’s my yeast bread with pumpkin puree. Hope you like it and please do check out what other bakers have baked using pumpkin or pumpkin spice or both. Mix flour, semolina, salt, sugar and yeast in a big bowl. Add pumpkin puree, water and butter. Mix the dough. I did the whole process in a machine as the dough can be sticky. Knead the dough for 7-10 minutes in a machine, 10-15 minutes by hand. Add the nuts and soaked raisins(currants). Knead it into the dough. Form the dough into a round ball. Grease it with some butter. Place the dough in a greased bowl. Cover it with a tea towel or cling film and let the dough rise for 11/2 hrs or till its double the size. Gently knead the dough. Divide into 2 for smaller loaves. Shape the dough into round shape. Place the shaped dough on a greased baking tray. Let the loaves rise for 35-45 minutes or till the dough is double in size. Bake the bread for 35-40 minutes or until the top is golden brown. Smaller loaves will take less time about 30 minutes. Cool the loaves on a wire rack. Serve the bread with soup, cheese or even toast it and enjoy with some butter, jam or marmalade. Use fine semolina and not the coarse one. To make fresh pumpkin puree at home, I cut the pumpkin into thick slices, coat it with oil and roast it in the oven for 20-30 minutes till its done. Scoop out the flesh and puree it in a food processor. If you happen to get a pale pumpkin, add ½ tsp turmeric powder to the pumpkin puree to give it that nice golden colour. Anyway turmeric is good for health and a natural colour. You made such a beautiful yeasted bread! I have not tried a yeasted pumpkin bread before. What a beautiful pumpkin bread. I was initially planning to make a yeast bread too, but couldn't. Will have to try this out some time. What a lovely bread, Mayuri. The color is beautiful and I bet it tastes as good as it looks. What a beautiful bread. I love using semolina in yeasted bread. It gives such a great texture to the loaf. This bread is gorgeous! The color is wonderful and I love the idea of the semolina! This sounds scrumptious! Especially with the hazelnuts! I love that idea! This sounds great! Love the nuts and raisins in this bread! 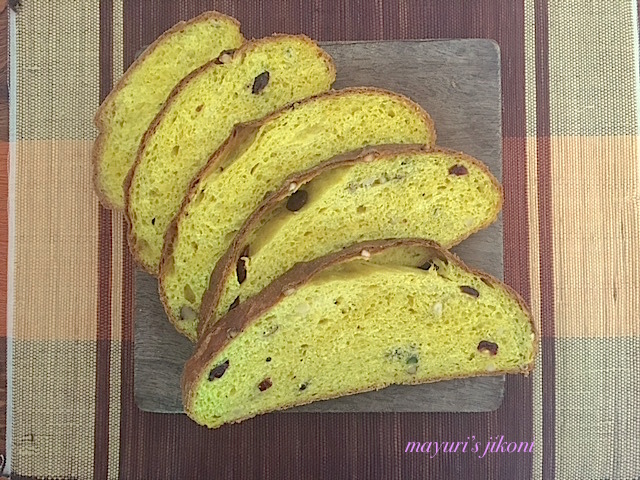 What a beautiful nutty bread you have baked Mayuri, will try this yeasted bread soon. Wow the color is perfect in this bread. Loved your bake for the month! It is Wendy, try it out. I was a bit apprehensive to try it out but is turned out good. Thanks Pavani, try it out, its good. Thanks Robin, it did taste good…well that's what my hubby and daughter said! Yes it does Eileen, this is my second bread with semolina and we loved it. Though I didn't have hazelnuts and used walnuts, it tasted really good. Thanks Heather, nuts and raisins always add flavour and bite to any baked goodies.